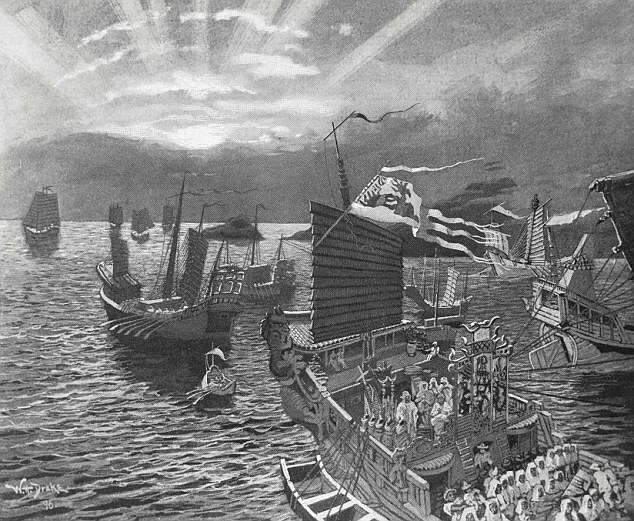 Archaeologists from the University of the Ryukyus and the Matsuura city board of education determined that the wreck was a part of the Mongolian invasion fleet partly based on its structure. Chinese ceramic wares dating from the 12th to 13th centuries were discovered in and around the wreck, backing up their conclusion, they said. The research team, which is surveying around the Takashima Kozaki underwater archaeological site, discovered the shipwreck last autumn around 200 meters off the southern coast of Takashima island and 15 meters below the surface. The remains of the ship measure 12 meters long and maximum 3 meters wide. The wreck was lying on the seabed apparently with its bow pointing southward. Yoshifumi Ikeda, a professor of archaeology at the University of the Ryukyus who is leading the research project, said his team has found potential shipwrecks from the Mongolian invasion at three other locations. “We have successfully confirmed the two ships from the Mongolian invasion, and further research on them is expected to lead to the discovery of even more sunken Mongolian ships,” Ikeda said.